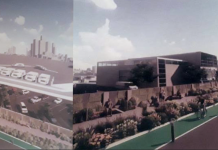 Hudson County View’s number 1 feud of 2014 was the battle for the Hoboken Housing Authority, taking the top spot for the dramatic ending to the long battle that pitted Hoboken Mayor Dawn Zimmer and HHA Chairwoman Dana Wefer against Assemblyman Carmelo Garcia (D-33). 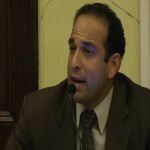 Garcia took over the HHA’s top post in May 2009 and developed a good rapport with a significant portion of the tenants, but he, as well as onlookers, knew life wasn’t going to be easy for him once Dana Wefer was voted the board chairwoman in May, per The Hudson Reporter. 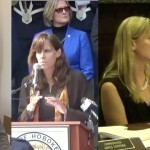 Wefer, who unsuccessfully ran for Morris County freeholder back in 2006 at the young age of 23, began to make some noise this summer when she questioned the HHA procurement policy that Garcia had approved for years. For a moment, it seemed like it was just business as usual in Hoboken: where everyone in “The Old Guard” hates everyone in “The New Guard” (and vice-versa) and it’s borderline impossible to get any actual business accomplished at a public meeting. However, all of a sudden, Garcia’s name was up for termination at a special meeting in August. Not surprisingly, the lifelong Mile Square City and housing authority residents staged a protest the day of the August 4 meeting. 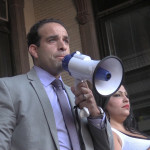 The protest fell on deaf ears though, as the rowdy meeting that saw a police presence from just about every neighboring Hudson County municipality ended with Garcia being fired after a decisive 5-2 vote from the board. If this wasn’t Hudson County, the story would probably end there, but since this is Hoboken, this was only the beginning. 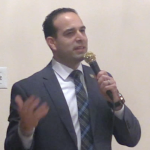 Garcia attended the next regularly scheduled HHA meeting where he called Wefer a liar for a multitude of reasons including the way a U.S. Department of Housing and Urban Development (HUD) report made it’s way to the media – also refuting some of the claims made in the report. 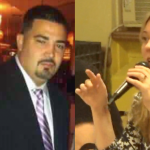 For a couple months, all was (relatively) quiet on the HHA front, until Garcia told Hudson County View he would be suing the agency for wrongful termination in November. True to his word, Garcia filed suit against the HHA, Wefer, board Vice Chair Dave Mello and his oldest nemesis, Zimmer, who he felt was out to get him for years now: evidenced in the previous lawsuit he filed in August 2013. Although the initial lawsuit, whose first draft infamously used the term “ethnic cleansing” to describe the way Zimmer was trying to mold Hoboken, was officially tossed out in Hudson County Superior Court on December 19. Thomas Abbate, a lawyer from high-powered Teaneck firm DeCotiis, FitzPatrick & Cole, told Garcia’s attorney, Louis Zayas, on Monday to withdraw his latest complaint or expect a countersuit in the near future. While this feud already feels like is has more chapters than “War and Peace,” it’s still far from over. Wefer, who has had a much easier time running HHA meetings with Robert DiVincent (again) at the helm, is a heavily-rumored candidate for the fourth ward council seat this November. Ruben Ramos, who used to sit in the same assembly seat that Garcia currently occupies, may come out of the woodwork for one last hurrah, looking to stick it to Fourth Ward Councilman Tim Ochipinti – who ruined his shot at the mayor’s seat in 2013 when he decided to run in the 11th hour. As for Garcia, he insists he will be getting the Democratic party line when he seeks re-election in June, despite reports to the contrary. However, if that doesn’t happen and/or he loses, odds are he will look to finally run against Zimmer for mayor in 2017 – even though Freeholder (D-5) Anthony Romano probably wouldn’t be a fan of that.